Emerging reports from Tibet say over hundred Tibetans were injured and one man committed suicide in Yulshul County, Kham region of eastern Tibet, after a massive crackdown carried out by armed Chinese military forces to disperse Tibetans peacefully protesting against diamond mining in the region. “The protestors were severely beaten by Chinese security forces with gun butts and hurling tear gas to disperse the peaceful protesting against diamond mining in Yulshul County in eastern Tibet. The situation remains tense in the county, as there is a growing anger over the severe crackdown,” sources said. “Local Tibetans are concerned that the mining activities are not sanctioned by the Central government officials and that they could trigger environmental problems, including pollution. Protesters raised their hands and shouted slogans such as “stop the destruction of the environment”, while putting up large banners displaying President Xi Jinping and his recent environment speech,” Ven Konchok told The Tibet Post International (TPI), citing sources in the region. “Over hundred Tibetans were wounded in the Chinese crackdown, while at least eight Tibetans were arrested and 15 others taken to a hospital. The total numbers of injured and arrested still cannot be confirmed, this hospital alone treating 15 protesters,” said Konchok Dhondup, Tibetan monk currently living in Dharamshala, citing local contacts. “Over 1,000 Tibetans gathered to protest against the mining activities in each of the three sacred Buddhist sites in Yulshul County. 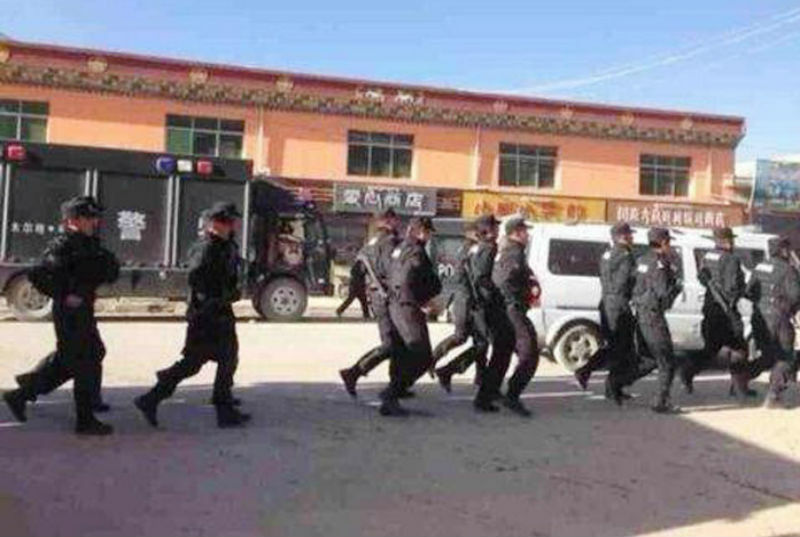 The massive crackdown followed a tense confrontation between local Tibetan protestors and Chinese miner workers at three sacred Buddhist sites having diamond reserves in Dzatoe in Yulshul County (Chinese: Yushu Prefecture in Qinghai Province) since August 13. “A Tibetan man identified as Sokpo Choedup was seriously injured after what appears to be a self-inflicted knife wounds and was taken away by Chinese police,” Ven Konchok said. “Hundreds of armed military forces immediately arrived at the holy sites,” said Konchok. 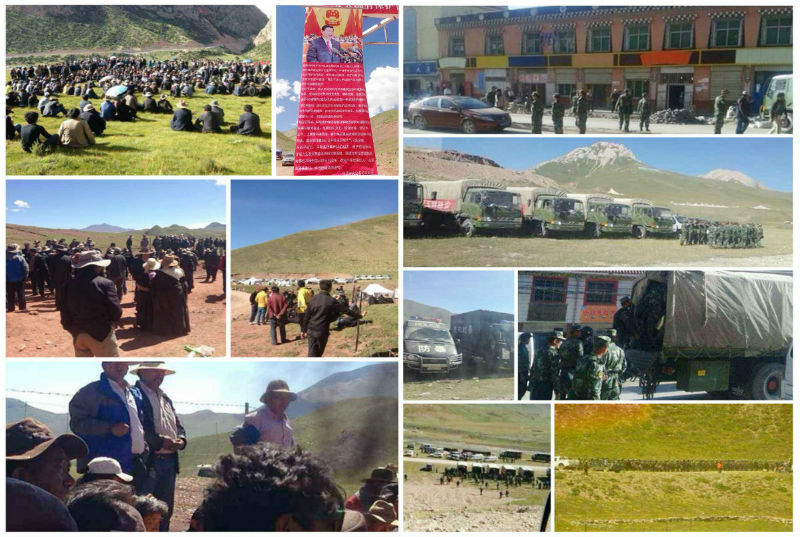 “Over 500 armed police stormed holy sites in Atod Yultso and Zachen Yultso and fired teargas to disperse the protestors. The protestors were tortured, severely beaten with gun butts, threatened with being shot if they don’t end their protests,” he added. “The local Tibetans however complained that the mining workers increase environmental destruction in the county, that against China’s environmental protection law and are carried out by the workers in coordination with corrupt state and local officials, without sanctions from the central government,” he further added. Konchok stated that the Chinese security forces have planned a major crackdown on those sitting in protest at Chi-dza holy site on August 17. “China’s large-scale exploitation of mineral resources in Tibet has led to sustained socio-economic and environmental problems. Massive influx of Chinese migrant workers into Tibetan areas deprives Tibetans of employment opportunities,” said the Central Tibetan Administration (CTA) baed in Dharamsala-India after the incident.